Over the past decade, psychoanalysis has been a focus of continuing controversy for feminism, and at the centre of debates in the humanities about how we read literature and culture. In these essays, Jacqueline Rose continues her engagement with these issues while arguing for a shift of attention - from an emphasis on sexuality as writing to the place of the unconscious in the furthest reaches of or cultural and political lives. 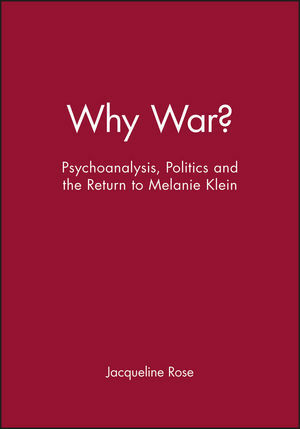 With essays on war, capital punishment and the dispute over seduction in relation to Freud, she opens up the field of psychopolitics. Finally in two extended essays on Melanie Klein and her critics, she suggests that it is time for a radical rereading of Klein's work. Jaqueline Rose is Professor of English at Queen Mary and Westfield College, University of London. Her numerous publications include The Case of Peter Pan or the Impossibility of Children's Fiction (1984) and The Haunting of Sylvia Plath (1991). 2. Margaret Thatcher and Ruth Ellis. Part II: The Death Drive:. 3. 'Where Does the Misery Come From?' - Psychoanalysis, Feminism and the Event. 4. Shakespeare and the Death Drive. Part III: Returning to Klein:. 5. Negativity in the work of Melanie Klein. 6. War in the Nursery. An Interview with Jacqueline Rose. Jacqueline Rose: A Bibliography, 1974-1992: Nancy Weyant. Appendix: Intellectual Inhibition and Eating Disorders: Melitta Schmideberg. Author enjoys celebrity for her controversial book on Sylvia Plath.